More and more people who curl their own hair at home are moving from curling irons to curling wands in order to achieve a more natural curl like they would get if they visited a regular hair salon. Ceramic pearl for a smooth salon finish. Tapered barrel creates a variety of different curls. Comes with heat protective glove. Heats up to 410 degrees Fahrenheit. 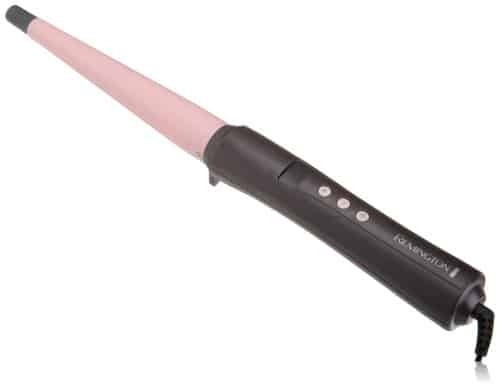 Heat lock holds curling wand at the temperature you want. The Remington C195A C/2 TStudio Curling wand is a reasonably priced curling wand that uses a ceramic barrel. Ceramic barrels are one of the best types of barrels for curling hair due to that fact that they distribute heat better than those old fashioned metal barrels curling wands of old. The barrel of this wand also contains real pearl, which is supposed to help the hair glide without sticking, however, there doesn’t seem to be any independent information regarding whether or not the addition of pearl really helps hair not stick to the wand. This curling wand comes in two sizes. Both wands barrels are thicker near the handle and thinner towards the end. The smaller barrel wand (1/2” to 1”) is best suited for shorter hair and those people with longer hair who want tighter curls. The larger barreled wand (1” to 1 1/2”) is best for people with long thick hair or those who want beachy waves rather than actual curls. 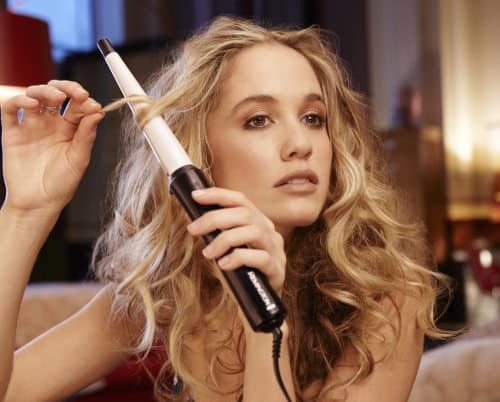 If you have never used a curling wand before (a curling iron without the hair clamp) then it is going to take some practice to master using it so that you can keep your hair on the wand without burning yourself. While this wand does come with a protective glove, the glove only offers protection if you brush against the tip of the wand briefly, it does not offer protection if your gloved hand rests on any part of the barrel. Realistically, you may need a little bit of practice to get better results. If you have hair that doesn’t hold a curl, then you will need to use hair spray, or styling gel even with this type of curling wand to improve the chances of success. Heats up fast so there is less heating time and you can begin styling your hair faster. Longer lasting curls for some users. The Remington C195A C/2 TStudio Salon Collection Pearl digital ceramic curling wand is a reasonably priced curling wand that performs exactly as curling wands with tapered ends are meant to function. The ability to select heat and the heat lock are nice additions to this wand that makes it worth considering. However, we would not advise purchasing this wand for teens or early teens simply due to the danger of painful burns in the hands of a someone inexperienced with the use of curling wands. In conclusion, this curling wand has all the right features and the right price to make it worth considering for those who want a curling wand to curl their own hair at home.